AZ Formula is still alive! A promotional email has just arrived in my mailbox offered me an incredible automated profit system that can make me rich overnight, about $10,000 per week to be exact. WOW! I was shocked to see this promotional email because I thought this company has died, gone, no longer exist. NO, AZ Formula is still going and going strong. This company has taken a beating from online reviewers. 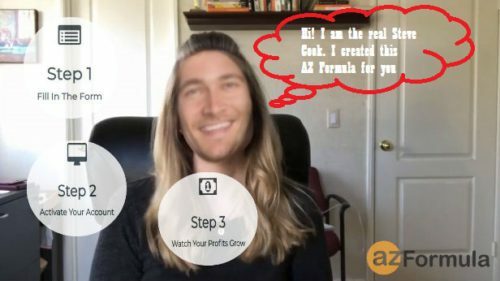 Many of the AZ Formula reviews online has labeled the program as a scam. Hello, this is TQ. Here’s my profile. I make a living online as an affiliate marketer. I have heard about AZ Formula before. Many online AZ Formula reviews want people this program is a scam. However, someone is still promoting this product. This tells me you can make money with AZ Formula. Affiliate marketing is a lucrative online business. There are many ways to make money online as an affiliate marketer. I have written a ‘Guide To Make Money Online‘ which describes all options for you to make money with your affiliate marketing business. 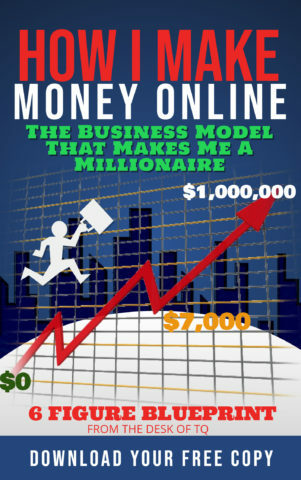 If you are looking to start an online business, I suggest take a copy of this guide. If AZ Formula is a scam, then who still promotes AZ Formula. My curiosity has led me to discover an interesting secret in the world of making money online that I am about to tell you in this scam or legit, AZ Formula Review. This will be an interesting story for you to read. Is AZ Formula a Scam? A lesson from AZ Formula? AZ Formula is created by someone goes by the name of Steve Cook. An interesting name Cook rhymes with Crook. AZ Formula is introduced as a one-click affiliate marketing profit system that ordinary people with no tech experiences can make up to $2,000 per day. The most interesting about this online business opportunity is that you don’t have to do anything to achieve $2,000 per day passive income online. This is super easy, right? It also sounds like a scam. Ste 3 – Sit back and watch your profit growth, $2,000 per day or $40,000 plus per month. From the moment of its launched, this affiliate marketing training program is bombarded with negative reviews from product reviewers all over the world. The reviewers are right to be suspicious of this “one-click affiliate marketing system,” because the whole thing looks like a scam. Me too, I gave this program a thumb down. Until today, I learn something new that I have never thought about it. Bad impression starts with AZ Formula promotional online video. 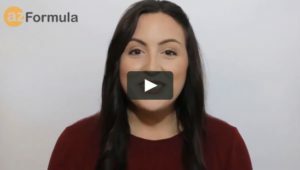 After watching the sale video, many people were confused because the presenter did not talk about what you were really getting from AZ Formula, and how the program works to make money online. The entire program is presented with a mysterious tone that allows people to guess. Some say this is an e-commerce system teaching you how to sell on Amazon, while others claimed is an affiliate marketing system. If you haven’t watched AZ Formula video, this is your opportunity to tell us what you think? AZ Formula is neither an eCommerce or an affiliate marketing training program. If you are new to affiliate marketing, click here for a little lesson on affiliate marketing for beginners. After paying the $37, here’s what you see inside AZ Formula. The program divides into 4 different levels according to difficulty and the amount of money that you can make. Level 4 is the highest and can generate online income up to $2,000 per week. Introduction to eCommerce platform and how it works? These lessons are worthless. They are used to preparing you for upsell. When you first look at the training outline, one might say this is the 4 steps to affiliate marketing. A closer look reviews these training lessons are trashed. They are not focusing on anything. Some talks about eCommerce, some talks about affiliate marketing. What is it? As a member of the AZ Formula, you will be bombarded with upselling to improve your chance of making more money online. This is a marketing trick used by many online programs offered through Clickbank. Upsell does not mean the program is a scam. But in this case, AZ Formula, “one-click affiliate”, is used as bait. A baiting program is something exciting to get you in the door, then switch to sell you another product. AZ Formula is a bait and switch program. This is what AZ Formula is about. AZ Formula offers two upsell packages: ‘Gold AZ Package’ for $197 and the ‘Platinum AZ Package’ for $297. These packages are supposed to contain top training secrets to make $2,000 profit per day online. If you don’t purchase any of these packages, you will not make money. This similar scam is used by a lot of online business opportunities. The problem with AZ Formula is that the customers receive trash for $37.000. This is why many people labeled AZ Formula a scam. Using customers or clients testimonials to promote a product and service is a common marketing technique. I agree AZ Formula testimonial might be fake, but the person that created this program cannot be fake. I want to know who he is. We all agree Steve Cook is a fictitious character created by someone or a group of affiliate marketers to sell AZ Formula. Using a third party to promote your product is not by itself a scam. This is how movie stars and famous people make money through endorsements. The problem with AZ formula is that the founder Steven Cook doesn’t appear in any video, both promotional or training lessons. The image of Steven Cook is a stock photo that anybody can buy online. For me, I am too interested in who is Steve Cook. My investigation is to find the creator or creators of this character. It is obvious that the creator wants to hide his identity. The question is why anyone wants to do this if they have such a quality product like AZ Formula. There can only be one answer to this, AZ formula is a bait product created to generate publicity to promote another product or products. AZ Formula alone is not a system for you to make money online. It was not created for this. If you have a system that can automatically generate $2,000 per week consistently, would you give it away for $37? I let you answer this question yourself. AZ Formula was created to promote free publicity. Specifically, negative publicity. Negative publicity is a marketing strategy that only a few exceptional affiliate marketers understand and know how to use. In marketing, any publicity is good publicity, and negative publicity is easier to create, but generate more interests than a positive one. AZ Formula was so bad that it created a large number of negative responses from online product reviewers. All AZ Formula reviews called this a big scam. The negative reviews have created an online viral effect for AZ Formula. Everyone now talks about AZ Formula, and everybody wants to see how bad AZ Formula is? This creates free publicity for AZ Formula. Publicity translates into traffic. 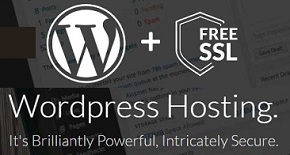 Driving free traffic to a website is the goal of AZ Formula. When you have traffic, you can generate online revenue, this is the golden rule of affiliate marketing. Yes, most online reviewers are correct to conclude that AZ Formula does not work. However, when you are looking at this from the promoters’ perspective, AZ Formula does work. It actually generates a lot of online passive income for the promoter from negative reviews. Yes, AZ Formula does not work to help you make money online, but it works for Steve Cook. Most AZ Formula online reviews agree this is a scam. They advise people not to buy into the program. I do not believe that you can make $2,000 per week doing nothing! No way, impossible. This is the reason I don’t like AZ Formula. I am not going to recommend not purchasing AZ Formula either. This is what the promoter wants all online reviewers to do. This is the kind of recommendations that AZ Formula wants online reviewers to do. First, they tell you it is a scam, don’t buy; then, they say it is ok to buy because you can get a refund. This type of advice makes the readers want to buy the program, even more, just to satisfy their curiosity. Now, you see how negative publicity works? Most people purchase AZ Formula out of curiosity. Oh, let see how bad this is! When you are buying something with a full understanding that it is a marketing stunt and it does not work, then you cannot cry “I got scammed.” I promise you that you will not get a refund from Steve Cook or Clickbank. AZ Formula has demonstrated to us that affiliate marketing does work, even when it is negative affiliate marketing. Negative affiliate marketing requires a higher level of marketing skill to make it works. Certainly, the creator of AZ Formula understands and knows how to play this very well. Using online negative reviews to generate a buzz for AZ Formula, then tap into people curiosity to sell the product. This is why AZ Formula is still alive and doing well. Many online product reviewers do not realize that their negative reviews create free promotions for AZ Formula. They thought negative reviews would kill the product, big mistake. Affiliate marketing is an easy way to generate money online if you know how to use it. Just look at AZ Formula. To become a good affiliate marketer, you must learn this trade from the best. Not many people can recognize or know the techniques of negative marketing, Only a few! I am able to recognize AZ Formula marketing strategy because of my years of experiences as an affiliate marketer. If you want to know more about me, read my profile. If you want to build a successful business and make money online, I recommend you visit this #1 Affiliate Marketing Training Program to learn the basic affiliate marketing for FREE. Let me tell you this, no program will make you rich overnight, certainly NOT AZ Formula. I hope this AZ Formula review sparks a curiosity in you to learn more about negative affiliate marketing, not to buy into AZ Formula effects. I invite you to try these 10 free affiliate marketing lessons teaching the process of making money online to start your journey with me.